Today’s AM fix was USD 1,301.00, EUR 948.67 and GBP 773.85 per ounce. Friday’s AM fix was USD 1,293.75, EUR 943.17 and GBP 769.72 per ounce. Gold fell $2.50 or 0.19% Friday to $1,293.10/oz. Silver slipped $0.12 or 0.62% to $19.36/oz. Gold and silver both finished up for the week at 0.34% and 1.10% respectively. Gold moved higher today in euros, pounds and dollars after the ECB and 21 other central banks announced a new gold agreement. The new agreement was expected but the timing was unexpected as the last agreement was not due to expire until September 27. 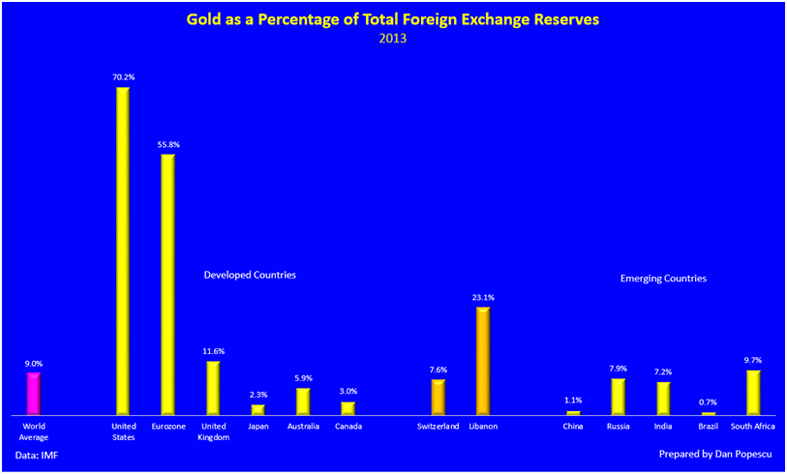 The crisis in Ukraine and risk of increased tensions between Russia and the west continues to provide support for gold. A further deterioration in relations seems likely and should push gold higher. Also supporting gold is the likelihood that the incoming government in India will relax import restrictions and duties, in the world’s second largest buyer. Over the weekend, incoming Indian leader Modi told thousands of supporters that he represents a break from past governments after winning the nation’s biggest electoral mandate in 30 years. Last week, Reserve Bank of India Governor Raghuram Rajan said that the new Indian finance minister will decide on easing gold import curbs. The ECB, the Swiss National Bank (SNB) and the Riksbank of Sweden announced a new gold agreement this morning. They announced they have no plans to sell significant quantities of gold and reaffirmed the importance of gold bullion as a monetary reserve. Twenty one central banks including the ECB, the central banks of the euro area (Austria, Belgium, Cyprus, Estonia, Finland, France, Germany, Greece, Ireland, Italy, Latvia, Luxembourg, Malta, the Netherlands, Portugal, Slovakia, Slovenia, Spain), the SNB and the Riksbank announced the fourth gold agreement between the central banks for the next 5 years. - Gold remains an important element of global monetary reserves. - The participants in the gold agreement will continue to coordinate their gold transactions so as to avoid market disturbances. - The participants currently have no plans to sell any substantial quantities of gold. The press release from the SNB can be read here. The agreement, which applies as of 27 September 2014, following the expiry of the current agreement, will be reviewed in five years’ time. The first gold agreement was concluded in 1999 in order to coordinate planned gold sales by the different central banks. The agreement was extended in 2004 and 2009. The timing of the announcement was unexpected as the current agreement does not expire until September. It is understandable that the central banks value their gold as “important element of global monetary reserves,” given the still lingering economic problems in Greece, Italy, Spain, Portugal, Ireland and Cyprus and continuing ultra loose monetary policies in the Eurozone - with the possibility of negative interest rates. Thus, European central banks are likely to continue to be reluctant to sell their substantial gold reserves which total of 10,779.3 tonnes or 8,972.6 tonnes ( EU G6). There is also the fact that while Eurozone banks balance sheets have recovered somewhat, many are far from robust and remain vulnerable. Should there be a ‘Black Swan’ event or economies slow down again, central banks may require their gold reserves in order to maintain confidence in the single currency and other fiat currencies. It is believed that there is little appetite for a new gold agreement among the rest of the world and among the emerging market central banks such as China. Most of the central banks that were signatories to the Washington Agreement, clearly do not want to sell their gold reserves. The World Gold Council released data showing that global official gold reserves totalled 31,890.7 tons as of February, 2014. Of this total figure, the euro area held a total of 10,779.3 tons making it the largest holder of gold reserves in the world with 36.6% of the total global gold reserves. The second largest holder of gold reserves is the U.S. with 8,133.5 tonnes. 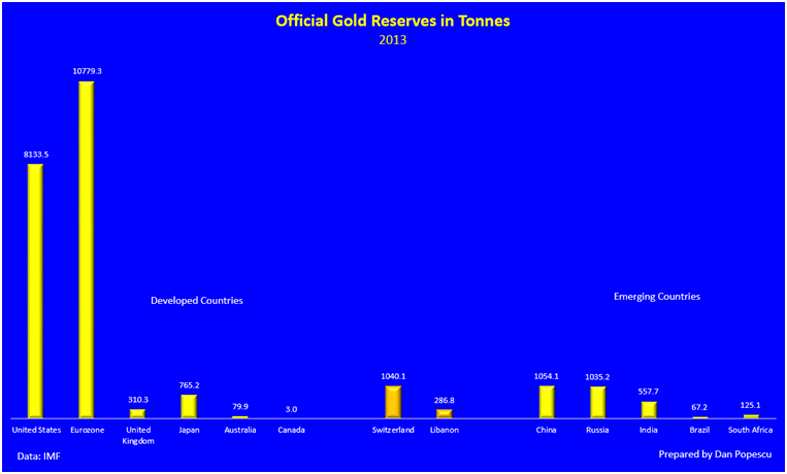 China's central bank gold reserves data has remained at 1,054 tons since the beginning of 2009. No change has occurred in 4 and a half years, despite most market participants believing that China is quietly accumulating gold reserves. China is likely to announce a sharp increase in their reserves to over 3,000 or 4,000 tonnes in the coming months. The previous European gold agreement, agreed in August 2009, committed the central banks to sell no more than 400 tonnes per year and no more than 2,000 tonnes in the five-year period. Sales under the current pact have only totalled around 200 tonnes, 10 times less than was permissible. The global and Eurozone debt crisis created a new found awareness of gold as a safe haven monetary asset. This reluctance to sell gold is likely to continue. Indeed, many central banks are already under pressure to repatriate their gold reserves from the UK and the U.S.
Gold reserves and the price of gold are closely watched on financial and foreign exchange markets - as a barometer of inflation expectations, of systemic risk and of confidence in fiat currencies. The central banks at the time of the first agreement, the Washington agreement, affirmed that gold remained an important part of the global monetary system, setting the basis for a long and upward trend for the gold price. The initial statement does not mention the sales ceiling for the pact and some market participants are surprised they did not reaffirm the sales ceiling. The European Central Bank has told Reuters that there is indeed no formal ceiling included in the new CBGA. There was no mention of gold leasing and the use of futures and options by central banks in the agreement. There was in 1999 and 2004 but not in 2009 and again now. The Bank of England did not sign the agreement. The Bank of England signed the first Washington Agreement in 1999 but opted out in 2004 and 2009. The opt out may be because the UK gold reserves are now insubstantial. By signing the agreement, the BOE might again draw attention to Gordon Brown's controversial gold sales.